Description: Another extraordinary release of major works by one of the true originals of 20th century music. Nordgren's idiom is so individual, so wide-ranging in reference and yet so cohesive, and so emotionally gripping that one has to look far and wide to find his equal. His influences come from all over the place, but are as remarkable for what he leaves out - the trends in integrating and fusing styles that frequently arise in contemporary music - as for what he includes, and the apparent effortlessness with which he persuades the most disparate elements to sound as though they have always belonged together; you would never think of describing his music as polystylistic, because it sounds like one monolithic style, as indivisible as the mineral crystals in granite. His use of what would in many composers' vocabularies be grinding dissonance but in his sounds as inevitable as tonal harmony, is fascinating. One of his basic elements was a series of chords repeated twelve times, encompassing 48 notes. Used freely, this enabled him to generate the most fantastic dissonant, clustered chords with pronounced tonal centres, that allow logical chordal progressions in textures of sonorist density. This device is evident throughout the three works on this disc. Combine this with his unerring sense of the precise psychological moment to introduce, in a stunning coup de théâtre, a sudden resolution into lush Wagnerian late-romantic harmony, and what emerges is an idiom of the utmost expressiveness, capable of exploring the deepest tides of emotion. The Violin Concerto No.4 is turbulent and tragic in mood. The soloist's tormented utterances, and the dark landscape in which the drama is set, are perfectly balanced and masterfully illustrated depictions of the utmost wildness; the dense, impasto texture of jagged, shadowed formations, somehow both alien and disquietingly familiar, are thrown into even greater relief by oases of gorgeous tonal harmony, or sudden timeless episodes of frozen immobility. The central section of the concerto, with its impassioned, eloquent solo aria and suddenly subtle and gentle orchestral accompaniment, is profoundly moving. A stormy counterpoint of conflicting currents interrupts and is becalmed, swells again and is becalmed, and a long very tonal coda brings a final hard-won radiance. The Horn Concerto somehow manages to sound very Romantic and tonal, despite the quarter-tone inflections that constantly color the solo part as it evokes its forebears, the hunting horns and horn signals echoing across lonely valleys between majestic mountains. A tender melancholy pervades the work, which is nonetheless not without its massed stormclouds, and some passages even briefly suggest the meditative purity of Pärt, while proving the composer's disclaimer that "I cannot write such pure music. Even if I try to do so, soon some unexpected things will get in the way". The rock of Rock Score is the geological kind; the work was commissioned for the inauguration of the Folk Culture Centre in Kaustinen and its hall scooped out of the granite. 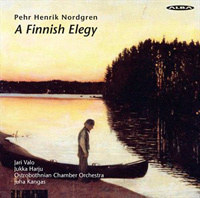 Nordgren described the piece as “a musical fantasy carved into the rock”. After a tumultuous multi-polyphonic introduction swirling around an F major chord, it introduces folk-like material, though in strange dissonant perspectives. The juxtaposition of these folk-carvings and the massive slabs of uncarved stone occupies the rest of this 15-minute megalith. Jari Valo (violin), Jukka Harju (horn), Ostrobothnian Chamber Orchestra; Juha Kangas.